Today Joomla is one of the most popular Content Management Systems which website owners choose when it comes to designing a new website, blog or an online shop. Many aspects like friendly user interface, extensibility and free CMS access make Joomla attractive for millions of users all over the globe. Joomla powers websites of all shapes and sizes from small introduction website pages and blogs to large online stores and corporate websites. Placing the chat button or text chat link to a fixed position on the browser window, making it visible when visitors scroll the page up and down. Vertical chat icons as well as the ones for top and bottom positions are available in the gallery. Showing or hiding the chat button or link for specific menu items or single posts which open directly without being linked to Joomla menu. Monitoring the whole website while hiding the chat button or link on specific pages. 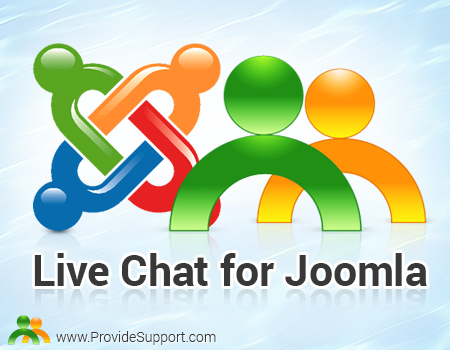 All these features make Provide Support Live Chat module for Joomla powerful and easy in implementation as it lets make basic Live Chat integration directly from Joomla admin area. However, still there are a lot of features available for customizing directly on Provide Support website. Such customization options like uploading Company logo, creating individual Post Chat Survey, updating the Pre-chat and Leave a Message Forms enable you to make the Live Chat tool an integral part of your website. Just give it a try and see how the Live Chat tool will blend with your website and improve your customer support services. For testing purposes free 10-day fully functional trial is available. Get Joomla Module here. This entry was posted in News and tagged joomla chat, joomla live chat module, joomla module, live chat for joomla, live chat module, live chat module joomla. Bookmark the permalink.